Suashish invests in and backs young entrepreneurs who are seeking to create new disruptive business that can potentially be billion dollar opportunities. 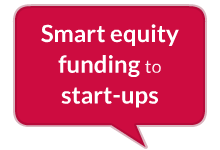 The firm ventures in providing smart equity funding to start-ups. The group provides support to entrepreneurs in business development and assists in penetrating new markets. A window of future access to finance is also open thus entrepreneurs see new vistas of opportunities when teaming with Suashish. The company provides customised early seed capital in the form of equity, debt or mezzanine finance. Copyright © Suashish Diamonds Ltd, All rights reserved.